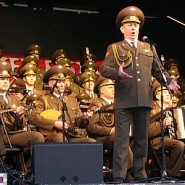 When Natan Sharansky was imprisoned in the gulag, I don’t think he would have been able to imagine this scene in his wildest hunger-induced dreams… The Red Army Choir performing Hava Nagila. My favorite part is when they grab hands and perform their little Yiddishe dance. The lesson? Things feel dark, hopeless, impossible? Feel like Evil has won and driven Hashem out of the world? Just wait…Hashem’s kindness is waiting for you right around the corner. This is unbelievable! And your conclusion is so true. how unusual – how did you find it?